On 4 October 1957, the Soviet Union sent the world’s first man-made satellite into orbit. Sputnik 1 circled the Earth for exactly 3 months, beaming back signals for 21 days. It was a small aluminium capsule 58 cm in diameter and weighing just over 80 kg, orbiting the planet at an altitude of between 200 and 900 km. Nicknamed the "simplest satellite", Sputnik 1 carried a radio transmitter emitting the famous beeping signals heard around the world, four antennas and temperature and pressure sensors to collect data about the upper atmosphere. 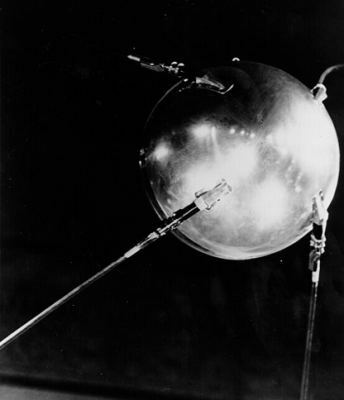 Although the use of satellites for science was still some way in the future, Sputnik was a strong symbol that kick-started the development of space applications. Back in 1955, the idea that satellites might serve a useful purpose was dismissed as fanciful. Now, their utility is undisputable. Today, about 2,500 satellites are circling the globe. Over the years, mission objectives have diversified, technologies have improved and become more complex, and we have pushed back the boundaries of space exploration. As a result, we have developed a closer understanding of the laws of orbital mechanics and acquired considerable expertise in the design, assembly and operation of artificial satellites. Satellites are built for a broad variety of missions, so each one is different. However, just as any motor-driven vehicle has a chassis, an engine, fuel tanks and steering systems, all satellites share the same basic structure and organization. The core element is the platform or bus, which accommodates the mission payload and all the equipment needed to operate it. In particular, the bus provides the systems for acquiring measurements, communicating, sending and receiving commands, and performing management and housekeeping operations. It is usually a very rigid truss structure designed to withstand the accelerations and vibrations generated during launch. Literally, a satellite is a celestial object orbiting a larger body in periodic fashion as a result of gravitational attraction. Since the beginning of the space adventure, we have made a distinction between natural satellites like the Moon and artificial satellites. However, the term satellite used alone is now commonly used to describe the man-made variety. Depending on its mission, a satellite may carry a number of instruments, for example to acquire imagery, record data, and transmit and receive radio signals. It generates its own power from solar panels. An Earth satellite generally orbits at an altitude of between 450 and 36,000 km. Its motion is sustained naturally by gravitational attraction. However, it also has its own propulsion system for orbital manoeuvres, which in some cases may include boosting the satellite to its final orbit. All these systems are controlled by an onboard computer that manages all the equipment and communicates with ground stations. All satellite systems need electricity. It is usually supplied by solar panels made up of photovoltaic cells, which convert energy from photons in the Sun's rays into electrical energy. 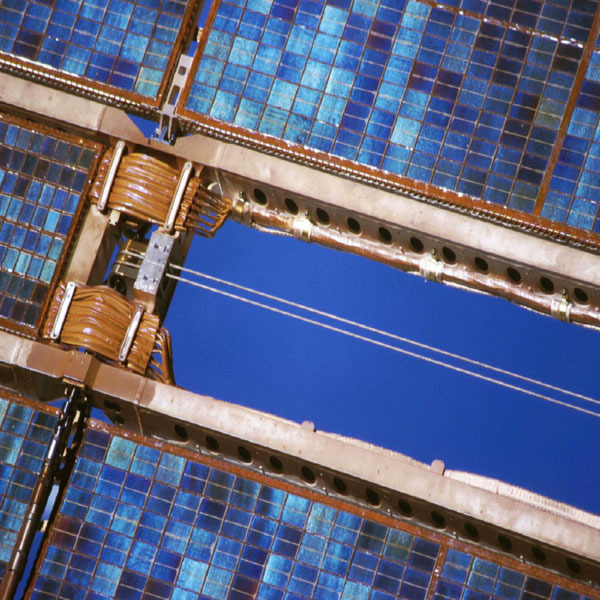 On a satellite in low-Earth orbit, solar energy incident on the solar cells provides a power of 1,400 watts per square metre. But solar power systems are not very efficient, since only 200 watts per square metre of this energy is retrieved and used. As a result, the cells must be turned towards the Sun all the time to gain maximum power. Certain interplanetary probes operating in deep space a very long way from the Sun have solar panels spanning 30 square metres and use nuclear radioisotope thermoelectric generators (RTGs) as a supplementary power source. Power generated is used immediately by the satellite or stored in batteries so that systems can continue to function when the satellite passes in the Earth’s shadow or when it needs to draw extra power. Most energy consumed is converted to heat, which does not dissipate easily. Heat exchanges therefore have to be controlled to avert overheating or excessive cooling. 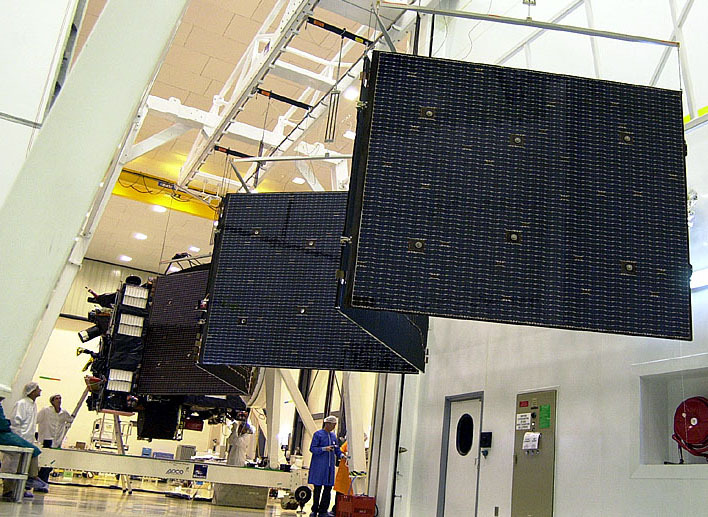 The satellite’s internal temperature is regulated by reflective and insulating blankets. Excess heat is rejected to space by radiators. A satellite begins its life in space tucked inside the launcher fairing, which shields it from friction forces during ascent through the atmosphere. Mounted on a small attach fitting, it separates from the launcher by means of a pyrotechnic and spring-loaded release mechanisms on reaching its intended transfer orbit. In the first hours after separation, the satellite deploys its solar panels, adjusts its attitude with respect to the Earth and Sun, and performs manoeuvres to reach its final orbit. These operations are part of the positioning phase, which varies according to the mission: in low-Earth orbit, the satellite is usually injected into an orbital trajectory near the intended orbit; in geostationary orbit, it is injected into a transfer orbit first. At this stage in the mission, the satellite is not yet ready to begin routine operations. The in-orbit checkout phase is designed to validate system performance in a real operating environment, which is impossible to achieve on the ground. During this phase, the satellite’s instruments are progressively switched on and tested. At the end of in-orbit checkout, which may last weeks or months, the satellite is declared fit for service. On orbit, the satellite travels at a speed of 11,000 to 28,000 kilometres per hour, depending on its altitude. Various phenomena perturb its orbit, so it cannot hold its trajectory on its own. 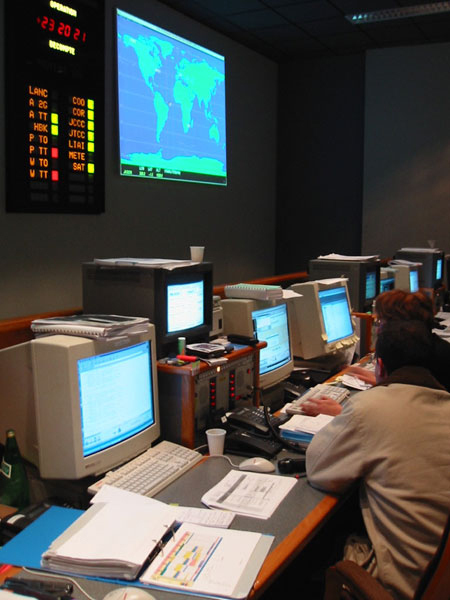 Stationkeeping operations, performed by ground controllers and the satellite’s onboard computer, make the necessary trajectory and attitude corrections throughout the mission to ensure that it continues to operate according to plan. Ten hours before launch, telemetry from the satellite is sent to the operations control centre, where ground controllers keep a check on remotely measured parameters. They can thus prepare to control operations of equipment they will be monitoring during the mission. Many parameters, such as temperature, voltages and attitude, are too complex or too laborious to be controlled permanently from the ground. The satellite's onboard computer is therefore programmed to perform these tasks, handling operations automatically in response to readings from a range of sensors. 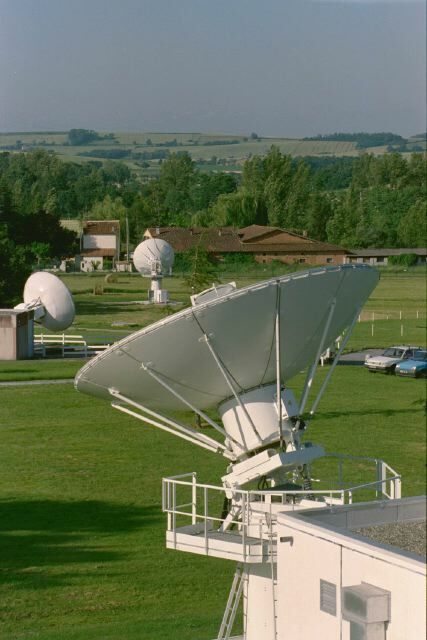 Depending on its orbit, the satellite may be in contact with the ground almost all of the time, sending data via its antennas so that the control centre can keep track of operations. In turn, ground controllers regularly uplink commands to reconfigure the onboard computer or equipment. To accomplish their mission, get enough power and communicate with Earth, the satellite’s instruments and antennas must maintain a precise orientation in space, which is obtained by rotating the bus. Satellite positioning and stationkeeping operations also involve performing orbital manoeuvres. For this purpose, the satellite has its own thrusters that can be fired automatically or activated by ground controllers. Most thrusters today use chemical propulsion. As a result, a satellite’s service lifetime is dictated mainly by the amount of propellant on board, since it is inoperable once it can no longer be controlled. However, new and better forms of propulsion using ion thrusters or plasma thrusters are increasingly being used. Seen from the ground, a satellite is just a dot in the sky. It is impossible to determine its attitude, or orientation, directly. For this reason, it is equipped with star sensors or star trackers able to measure their position with respect to the Sun, certain stars or a point on Earth. On the basis of this positional information, we can calculate the satellite’s orientation. De bas en haut : les satellites METEOSAT, MARS EXPRESS, SPOT 5. Military activities, mostly using civil space technologies for surveillance of theatres of operations and rapid communications guaranteeing transmission integrity and security. Depending on its mission, the satellite’s payload may comprise imaging instruments, measuring instruments or transponders, which amplify and transmit radio signals between the Earth and the satellite.